Good old #32 is back (apparently in Spanish)! 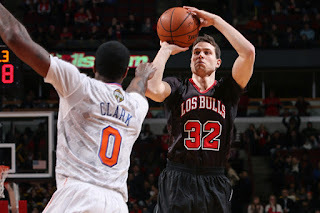 This is going to be a short post, but I feel like I wouldn't be the Jimmer fan that I am if I didn't at least make some quick comments about his departure from the Kings and his debut with the Chicago Bulls. Truthfully, I wasn't too happy when I found out Jimmer was joining the Bulls-- they are my 2nd least favorite team in the NBA, after the Lakers. Although I guess I must admit that is mostly because I'm one of those bitter Jazz fans who's still angry about Michael Jordan stealing the only shots the Jazz ever had at an NBA championship in 1997 and 1998. While I definitely think Michael Jordan is a talented basketball player, I never liked him as a person and his ability to get away with anything and everything, and I guess that tainted my opinion of the Bulls. I don't know a whole lot about the current Bulls team, but I'm sure I'll learn more in the coming months, and I guess we'll see if my opinion changes . . . they definitely get bonus points for seeing the potential in Jimmer! Anyway, I'm mostly happy that Jimmer FINALLY got out of the disaster he was stuck in for far too long in Sacramento. I think the contract buyout was the best 25th birthday present anyone could have given him this week. Jimmer's happy; I'm happy. Maybe the Bulls aren't so bad after all . . .